Batman: The Animated Series and The New Batman Adventures did great things for many of Batman’s villains, but Catwoman’s episodes never reached the heights of other rogues like Mr. Freeze, Clayface, and Joker. The writers could never find the right angle for Selina Kyle, and beyond being a seductive thief, her character is ill defined. 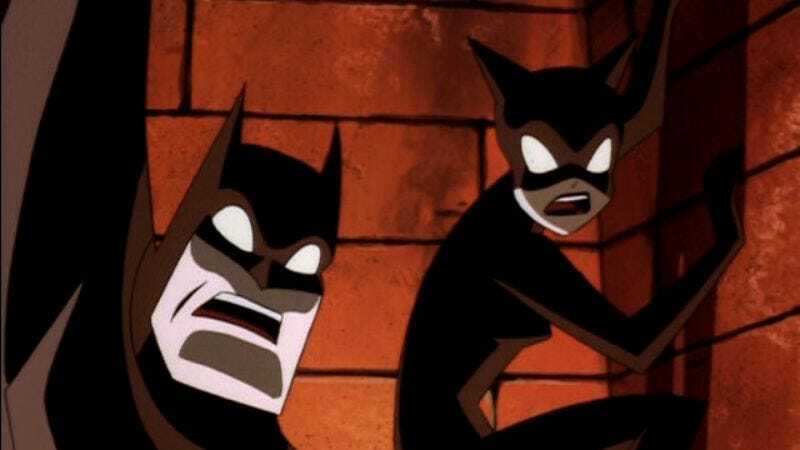 “Cult Of The Cat” is Catwoman’s last appearance on The New Batman Adventures, a lackluster story that is saved by some dynamic action sequences but is otherwise forgettable. The feline fatale is on the run from a cat-worshipping cult that she’s recently robbed, turning to Batman for help in getting the gang of assassins off her back. He’s not enthused, but when Selina is captured, he ends up going against the cult anyway, landing in the usual death trap scenario when he’s forced to fight a giant saber-toothed cat. The episodes of this series that have the hero facing off against a shadowy organization are almost always less interesting than having him fight his rogues’ gallery. These kinds of secret cults tend to be lacking in personality, and it’s just not very fun to watch Batman take on a villain that has no defining characteristics. The titular cult in this episode is run by Thomas Blake, who comic-book fans will recognize as the alter ego of the antihero Catman, although the Blake in this episode is nowhere near the same character. At the time of this episode’s airing, Blake was a misfit villain that no one took seriously, so the changes to his character on this series help to make him a little bit more of a threat. Unfortunately, he’s a completely cliché character, stroking his white cat and letting his henchmen do all the work for him. Thomas Blake was a relatively minor character in the comics until Gail Simone brought him on to her new Secret Six team, giving him a studly makeover, a mercurial sense of heroic duty, and a disturbing, tragic backstory. She basically did for Catman what Ed Brubaker had done for Catwoman a few years previous, readjusting the character’s look and motivation so that he would become more of a contender. It’s something that I wish the New Batman Adventures writers did with Catwoman during the revamp, but beyond a few costume modifications, she remains a one-note character. Catwoman double-crosses everyone if it means she gets what she wants, and when she’s kidnapped by the cult, she decides to join them rather than fight them. This is all part of a plan to just steal more, and when Batman arrives to save her, she knocks him out to prove her loyalty to the cult. The most intriguing aspect of Catwoman’s character is that she’s one of the few villains that will try to subdue Batman with a kiss, but the Dark Knight has become aware to her seductive tactics. 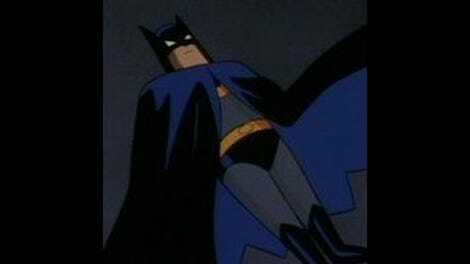 This episode’s best moment is when Catwoman kisses Batman when he comes to rescue her, and he responds bluntly: “Now can we go?” She doesn’t appreciate being talked to like that and knocks him out, handing him over to her hosts who strip him of his utility belt and throw him into an arena to fight a genetically-modified prehistoric cat. The story is a disappointment, but the animation in this episode makes it easier to swallow. The team of Koko and Dong Yang isn’t quite as impeccable as TMS, but they work well with director Butch Lukic to create spectacular fight sequences. The opening scene of Catwoman fleeing the cult through a labyrinth is choreographed to show how slinky and acrobatic Selina Kyle is in battle; her would-be assassins move with similar feline agility, but they have characteristics more in line with large predator cats rather than the quick-moving housecats that Selina is inspired by. As much as she loves Batman’s attention, all Selina really needs to be happy are her cats and a whole lot of money, and that’s exactly what she gets at the end of this episode. While Batman is dealing with the remaining cultists, Catwoman runs off with a good chunk of the cult’s treasures, fleeing to Paris so she can have her happily ever after with animal sidekick Isis in a hotel room filled with diamonds. Catwoman may not be the most captivating of Batman’s rogues, but she certainly knows how to get a job done. Batman Beatdown: When Batman needs information on where Selina has been taken, he brings one of the cultists down to the Bat-cave and has his flying rodent friends surround him until he freaks out and falls into a chasm. Batman knows how to use the resources he has to get what he wants. Thomas Blake’s henchwoman looks exactly like Marvel’s female Wolverine clone X-23. Also, the assassins all look like Black Panther mixed with Wolverine. I like the all-black revamp look for Catwoman, but sometimes her head looks really big.